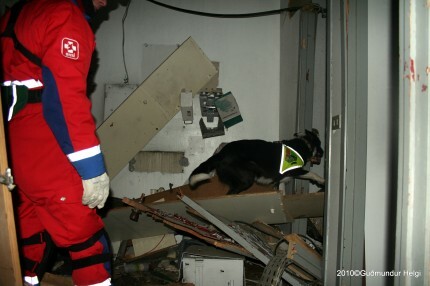 It is a finely refined dog that is capable of working as a SAR dog. Search and Rescue work requires an immense amount from the dog: intelligence, agility, stamina, drive, work ethic, confidence, and the ability to listen and respond to the handler. Not every dog is well suited to this task. Many SAR trainers prefer to work with puppies because this way you can select what you are looking for and put in the socialization and work to make a well rounded puppy. Older dogs can be used, but you will need to evaluate carefully to make sure that the dog doesn’t have any fears or problems related to lack of early socialization and exposure. When selecting a dog of any age, selecting one with a HIGH level of ball/play drive is necessary. You want a dog that is focused and intense about playing. The best way I’ve ever heard this described is that you want a dog that will play ball or toys with anyone, anywhere, for any length of time without becoming distracted. 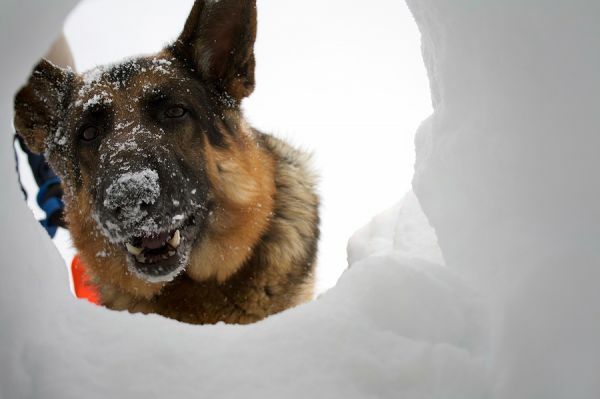 This demonstrates a dog that has such a high level of focus and desire for his toy that he will eagerly work in difficult conditions for hours on end simply for his toy. There are many breeds of dogs that can do the work, but often the German Shepherd Dog, Belgian Malinois, and Labrador Retriever are three of the primary breeds. Individuals of other breeds or mixed breeds can have the ability so long as they fit the requirements of stable temperament, trainability, high drive, and high focus. I can’t stress enough that the best dogs have a high drive, are well focused, and have no temperamental flaws. SAR work can be stressful work, and not every dog is up to it. Dogs can be trained for a variety of situations (live person, cadaver, water, wilderness, urban, disaster, etc. ), but we’ll focus on the beginning training for live person searches. There are a lot of facets that complicate the training depending on what you would like to do. Full search and rescue training can be anywhere from 6 months to a year or two depending on how many hours you invest in the training process. SAR training is a time consuming process! One of the best things to do is to make SAR work all about play. The dogs that have that intense play drive will begin to think of SAR work as just a game with their toy at the end of it. This is important both for the training and the dog’s work. The initial training can be started quite early with a puppy and can really be a Hide N’ Seek type of game. We want the dog to be excited about finding someone, so often the owner or person closest to the dog is the first person to start the game with the dog. Find It is one of the more common commands that will be used along with the game, but you can interchange commands, if you have one you prefer. Have a second person hold the dog on lead while you have the dog’s favorite toy and initially do a little tugging play with the dog. Excite him! Then, take the toy and run away in a direction the dog can see. If you want to make it very easy, drop to the ground. A little harder would be to duck behind a bush or obstacle that the dog saw you go behind. Once in place, the handler should release the dog and tell him to go Find It. Initial work is always easiest when the dog has a light wind to pick scent up from so when hiding, go so that the wind will blow your scent towards the dog when working outdoors. As soon as the dog runs right to you and finds you, make a big deal out of it and play tug. How you react when found is key to the eventual training. The dog has to think it is great fun to find someone. Once the dog catches on, ask other people to do a similar process with the dog and have them be the person that excites the dog and hides. Gradually you increase the difficulty of the search for the dog so he has to work harder in larger areas, at different times of day, over different terrains, etc. The dog will likely use more than one style of scent work to find you. Some dogs are more prone to air scenting naturally while others prefer ground scenting. Some dogs will flip between the two depending on the situation. They are always scenting the same thing: microscopic skin cells that we each continually shed all day long. You can lay the groundwork for SAR training yourself early on by playing games of Hide N’ Seek and working on obedience commands and control. 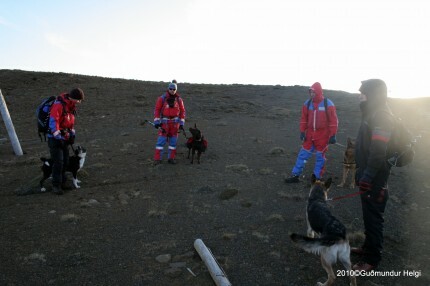 But, to get really closer to creating a SAR dog, you will need to do a lot of advanced training and work. It is best to look for local SAR training clubs. They can easily evaluate your dog to ensure it is good candidate for work. Additionally, they will be set up to assist with training for all kinds of SAR work plus be able to help you through the certification process for whichever training you do. To begin the process of locating SAR groups near you and learning about requirements, check out this link: http://www.sardogs.com/national_sar_organizations.htm It provides website links for many, many American, Canadian, and International SAR resources.